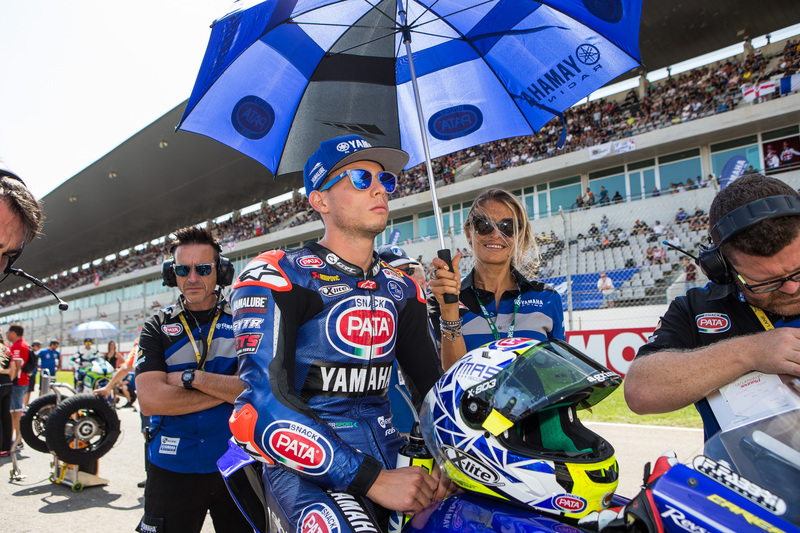 GRT Yamaha Official WorldSSP Team rider, Federico Caricasulo, started the second half of the season as he ended the first, with a win in today’s dramatic World Supersport race in Portimão, which was red flagged with two laps to go following an incident at turn 11. Alfonso Coppola joined his teammate in Parc Fermé as the best placed European Supersport Cup rider, despite starting the race from pit lane. Lucas Mahias crossed the line at the head of the race on the lap prior to the red flag, but was disqualified from the results for a track limits infraction as he attempted to return to pit lane after a rear tyre failure. It was series leader Sandro Cortese and his championship rival Jules Cluzel who made the early running at the head of the race, until a collision between the two saw them both go down at turn three on the second lap, leaving Mahias clear at the front of the race. The only challenge to the French rider came from his GRT Yamaha teammate, Federico Caricasulo, who pushed hard to close the gap to the leader. However the Italian was unable to match the speed and consistency of Mahias, who responded by increasing his lead to close to three seconds before being forced to slow after suffering a rear tyre failure. Caricasulo inherited the race lead shortly before a crash at turn 11 brought out the red flags and the race was brought to close with 16 of the original 18 laps completed. With the blistered and deflated rear tyre spinning on the rim, Mahias crashed twice on his in lap, as he fought to return to pit lane within the time limit. Initially the reigning World Champion was credited with the win, but victory was eventually handed to teammate Caricasulo when Mahias was disqualified for cutting the track in the final turn as he returned to pit lane. The GRT Yamaha Official WorldSSP Team appealed the disqualification on the basis that the regulations do not specify a rider must return to pit lane via the track following a red flag, but the stewards rejected the appeal. Today’s victory, a career first first back-to-back win for Caricasulo, saw the Italian move up to third place in the championship standings with 129 points, just 20 points behind series leader Cortese with three races remaining. The disqualification means Mahias drops one place in the standings to sixth with 103 points, 46 points from the top spot. Italian youngster Coppola managed to cap off what had been a difficult weekend with a visit to the podium, finishing today’s red flagged curtailed race as the top European Supersport Cup finisher. The result was just reward for Coppola’s hard work and commitment throughout the weekend, as he missed most of FP2 due to a technical issue and then was forced to start today’s race from pit lane die to exceeding his engine allocation. April 19, 2018 Michael Le Pard News Comments Off on One-two win for BMW riders at start of the European Superstock Championship.